Chris Brown’s been arrested again. CNN reports this is over him punching someone last year – allegedly – at a club when the man tried to take Brown’s picture. Now I’m trying to be fair here. Katharine Hepburn could terrorize people who tried to take her photo. Frank Sinatra could and did punch them out. Sean Penn got a nasty reputation for punching them out. So this isn’t like Chris is the first person to ever do this. But he has a record already and you’d think he’d be smart enough to stop this crap. Yes, he is only 29. But he’s also 29 with a very bad record already. For example, he could be completely innocent with regards to the current charges but due to his well known reputation he’s already not given the benefit of the doubt. If he continues like this, there’s going to be something a lot more serious (battery is serious but I’m saying something like a murder charge – vehicular?) and he will be tried by the press based on his bad image. Chris has talent. I wrote him off after his abuse a few years back. I don’t listen to him anymore. But he has talent. Right now, he’s allowing everything but his talent to define him. I’ve been thinking about Michael Jackson lately. He became a prisoner of his image. And he created Wacko Jacko. The chamber he slept in (he didn’t sleep in it)? That photo was posed for by Michael and leaked by Michael. The nonsense about the Elephant Man’s bones? Again, him. He was the biggest selling artist in the world after THRILLER and to stay in the news he created these rumors. By the time he was doing the BAD tour, they’d backfired and, especially in Australia, he became known as Wacko Jacko. And they were the first to question his traveling with young boys. From there, there was no coming back. He was the weirdo. He tried to walk it back and couldn’t. Where we get into Chris Brown territory? Michael? Maybe he was innocent. Maybe he didn’t do things to little boys. In the 90s, he was accused. And managed to walk on with little damage. So stay away from the little boys! But he couldn’t and ten years later it happens again. Chris is boxing himself in. I’m not a fan. But I do feel sorry for him. Friday, July 6, 2018. Violence continues in Iraq as it gets harder and harder to pretend the Islamic State was ever defeated. 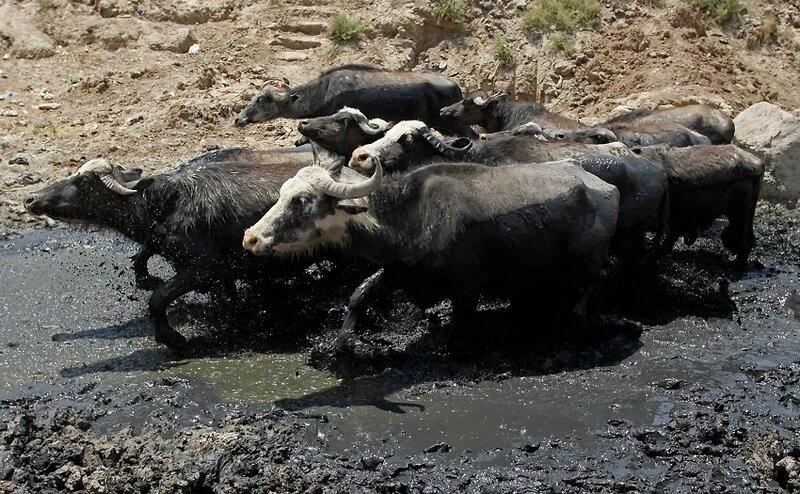 In addition, triple digits temperatures in Iraq as the drought gets worse. Islamic State (IS) militants executed seven people in Iraq's eastern province of Diyala after kidnapping them, a provincial police source said on Friday. The incident took place late on Thursday night when IS militants set up a fake checkpoint on the main road between Baghdad and the provincial capital Baquba, some 65 km northeast of Baghdad, and kidnapped seven passengers from a minibus, Major Alaa al-Saadi told Xinhua. Hayder al-Abadi based his re-election as prime minister on the claim that he had vanquished the Islamic State. Are you starting to get why he came in third? The US media could -- and did -- portray ISIS as defeated. It even tricked many news consumers; however, those living in Iraq were harder to fool. Now AFP reports on (yet another) major operation to combat ISIS. Islamic State affiliates have increased their activity in Kirkuk province in northern Iraq and are said to be focused on attacking civilians and government institutions. Authorities believe IS seeks to destabilize security and re-establish itself after being defeated by Iraqi security and international coalition forces. The group has been operating for months on Kirkuk's outskirts but has stepped up its efforts recently, kidnapping and killing civilians and carrying out random attacks. On June 27, an IS-affiliated group of five used light weapons to attack some villages in the Daqouk district in southern Kirkuk, killing one civilian and wounding others. Also on June 27, five people from the provinces of Anbar and Karbala who were kidnapped while working with security forces in Kirkuk were found executed on the Kirkuk-Baghdad road. In other violence, ALSUMARIA reports 1 corpse was found dumped north of Baghdad -- the corpse was handcuffed and had been shot in the head, a roadside bombing near Baji left two people injured, a sticky bombing outside Baghdad left two people injured, a bombing to the west of Baghdad left one Iraqi soldier and one civilian injured, and a Taji bombing set a police station on fire. Dropping back to Thursday's violence, Margaret Griffis (ANTIWAR.COM) notes, "At least 25 people were killed, and eight were wounded in recent violence, while six bodies were recovered in Mosul." As the war continues, critiques of it become more apparent. #Occupy: The #US #Empire is #Waning in its influence. The US is ostensibly a secular gov't. The invasion of Iraq killed more and destroyed more lives than ISIS could dream to. Yet our analysis doesn't dare condemn or blame them. That sorta stuff is why we say "Religion causes wars" but are blind to much much worse secular violence. 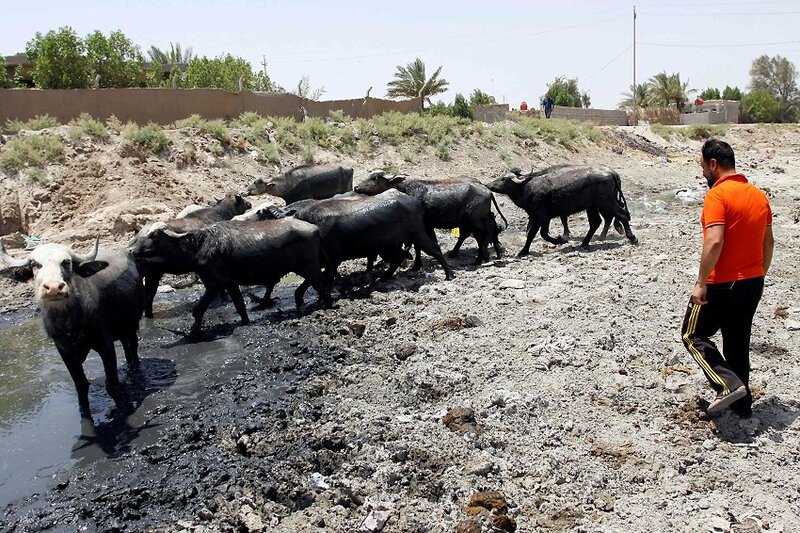 Turning again to the topic of the drought in Iraq, today, the temperature in Basra right now is 122 degrees Fahrenheit. Below is a video from last month that UNESCO put on Iraq's water issues. 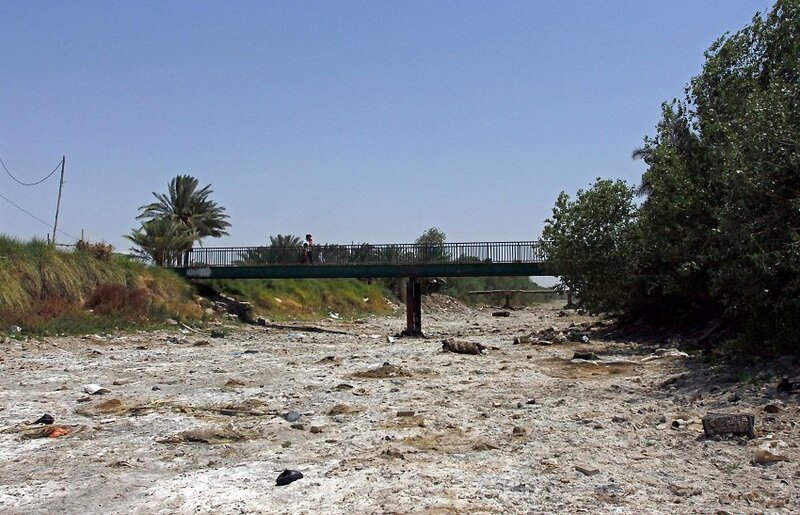 "As Iraq begins to recover from 40 years of wars and emergences, its existence is being threatened by the rapidly falling water levels in the two great rivers on which its people depend." The nature of those problems is a little more difficult to trace back. Money was not the issue apparently. In 2005, as the Iraqi Kurdish authorities resumed contact with the Iraqi government, Baghdad promised to put US$5 billion into the dam’s completion. Apparently the problem was the level of water in the dam and its size. There was concern about how much water the dam would collect and whether this would block the flow of water into the rest of Iraq. “It was the Kurdish leadership who would not accept the construction of the dam, despite the fact that the Iraqi government gave them three alternative designs for the project,” Mohammed, head of the regional department for dams in Iraqi Kurdistan, confirms. Over the course of two weeks researching this story, NIQASH tried to contact the Kurdish government’s spokesperson, Safeen Dizayee, several times to ask why but had no response. 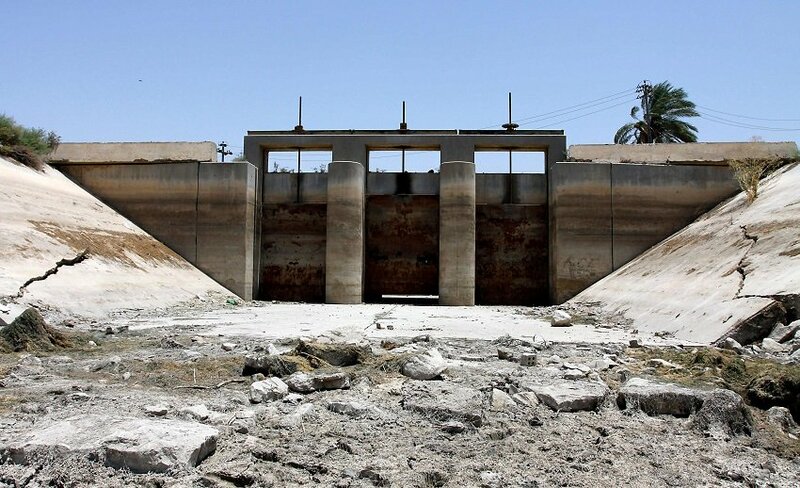 A large part of the “political” reason behind the lack of progress on the Bekhme dam also has to do with the fact that around 54 villages in the area would be submerged, says Karwan Karim Khan, mayor of Khalifan, where the Bekhme dam would be located. Are they trying to lose the mid-terms? THIS JUST IN! ALYSSA COMES OUT IN FAVOR OF ICE!